My Razer Wildcat sometimes freezes up and I need to unplug and replug it into my Xbox One to get it to work again. What is happening? If you are observing this behavior on your Razer Wildcat, please contact Razer Support at https://www.razersupport.com/contact-us/ or call +1-888-697-2037 to get assistance to update your controller's firmware. My Razer Wildcat controller is not working on Windows 8.1 / 7. Before using Razer Wildcat Controller on Windows 8.1 and Windows 7, please download and install Microsoft Xbox One Controller drivers found here. Plug in Razer Wildcat controller to Windows PC and execute the driver installer. Ensure that the Razer Wildcat controller is connected via the USB cable to the Windows PC. Launch Windows Control Panel via the Start menu. At the Control Panel, click on the "Hardware and Sound" category and launch the "Device Manager." At the Device Manager, right click on the "Razer Wildcat for Xbox One" device at the "Other devices" category and select "Update Driver Software…" option. At the "Update Driver Software" windows launched, click on the "Browse my computer for driver software" button. At the following window, click on the "Let me pick from a list of device drivers on my computer" button. Select on the "Microsoft Xbox One Controller" and click on the "Next" button. At the "Select the device driver you want to install for this hardware" window, select "Xbox Gaming Device" and click on the "Next" button. At the "Update Driver Warning" warning pop-up notification, click on the "Yes" button. Razer Wildcat controller should appear as "Xbox Gaming Device" at the Device Manager at the "Microsoft Xbox One Controller" category. You should now be able to detect and use Razer Wildcat Controller on Windows 8.1/7. How do I attach the palm grips to the Wildcat? Please follow the instructions here to affix the palm grips to the Wildcat. After activating the trigger stops in certain games, the actuation of the triggers aren't registering in-game. Why? While trigger stops are the hardware solution designed to allow gamers to actuate the left and right triggers rapidly by shortening their travel distance, these aren't supported by some games natively as such, we added a secondary feature called "Hair Trigger Mode" which allows gamers to actuate faster by reducing the activation response and time needed for the game to recognize the trigger pull. Press and hold the "Remap button" until the active "Profile Indicator" blinks. Press and hold the Trigger (Left or Right) you wish to configure. Press the "A" button to activate the "Hair Trigger Mode." Release your fingers once you feel the controller vibrates. Press the "B" button to deactivate the "Hair Trigger Mode." Can I use my Razer Wildcat on the PC? Absolutely! Your Razer Wildcat is fully PC-compatible, just plug the USB connector of your Razer Wildcat into the USB port of your PC and wait until the Xbox One Controller drivers are automatically installed on Windows 10. For Windows 8.1 and Windows 7, you may need to download and install a driver package. Please follow the instructions here. Why aren't the audio and audio controls working on Windows? Support for audio and audio controls via the Quick Control Panel on Windows will be coming at a later date. Can I use my Razer Wildcat on the Mac and on the Razer Forge TV? No, the Razer Wildcat is designed and licensed specifically for Xbox One and Windows. Can I record macros on the Razer Wildcat? 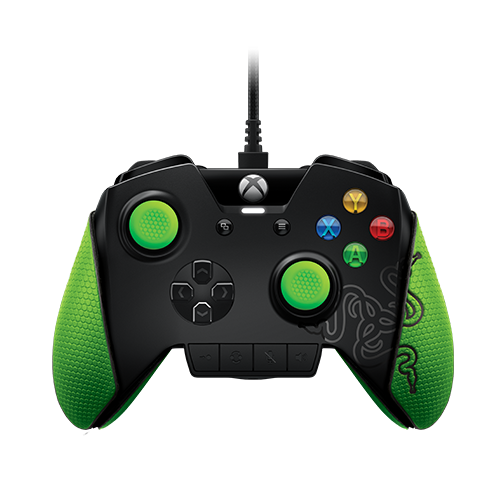 While you can remap any of the button on the controller to the four(4) Multi-Function Buttons via a 1-to-1 duplication of the selected button, the Razer Wildcat cannot record macros as it is designed specifically for tournament use and complies with all tournament rules and regulations. How do I remap the buttons in the default profile? You are only able to remap the buttons in profile 1 and 2 and not within the default profile. Please press the "profile toggle button" on the "Quick Control Panel" to select either profile 1 or 2 before you remap buttons. How do I clear a remapped button on the Razer Wildcat? Will the palm grips be sold separately in different colors? There are currently no plans for the grips to be sold separately and in different colors. Can the wire be detached so I can use my Razer Wildcat as a wireless controller? While the wire can be detached for portability, the Razer Wildcat cannot be used as a wireless controller as it is designed specifically for eSports and requires to have a stable connection and minimal latency for competitive gaming. Are the ABXY action buttons backlit? Will the Microsoft Chatpad for Xbox One work with the Razer Wildcat? Unfortunately, the ergonomic form of the Razer Wildcat does not fit the chat pad. How do I clean my Razer controller? / How do I clean the optional rubber palm grips? / How do I remove the residue after removing the optional rubber palm grips? We recommend cleaning Razer products with commonly available non-alcoholic wet wipes or moist towelettes. To clean your Razer controller, gently rub the non-alcoholic wet wipe on the area of the controller you wish to clean. Do not use harsh cleaning agents or scrub your Razer controller. If you're unable to find an FAQ article that helps resolve the issue, please contact our Customer Support team here. User guides and product manuals are also available on the Customer Support page.